Archaeologists have found a striking and apparently unique square monument beneath the world famous Avebury stone circle in Wiltshire. The UNESCO World Heritage Site, cared for by the National Trust, was built over several hundred years in the 3rd millennium BC and contains three stone circles – including the largest stone circle in Europe which is 330m across and originally comprised around 100 huge standing stones. 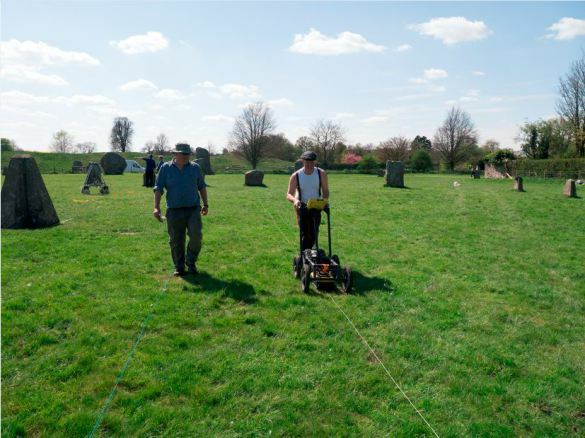 A research team led by the University of Leicester and University of Southamptonused a combination of soil resistance survey and Ground-Penetrating Radar to investigate the stone circle. Their work was funded by the Arts and Humanities Research Council (AHRC) and supported by the National Trust, as well as archaeologists from the University of Cambridge and Allen Environmental Archaeology. Radar in action: The Ground-Penetrating Radar survey underway (featuring Dom Barker & Kris Strutt of the University of Southampton). Avebury has been subject of considerable archaeological interest since the 17thcentury. The discovery of new megaliths inside the monument was therefore a great surprise, pointing to the need for further archaeological investigations of this kind at the site. The survey took place inside the Southern Inner Circle, contained within the bank and ditch and colossal Outer Stone Circle of the Avebury henge. Excavations here by the archaeologist and marmalade magnate Alexander Keiller in 1939 demonstrated the existence of a curious angular setting of small standing stones set close to a single huge upright known since the 18th century as the Obelisk. Unfortunately, the outbreak of war left this feature only partially investigated. The archaeologists who undertook the work think the construction of the square megalithic setting might have commemorated and monumentalised the location of an early Neolithic house – perhaps part of a founding settlement – subsequently used as the centre point of the Southern Inner Circle. At the time of excavation in 1939 the house was erroneously considered by Keiller to be a medieval cart shed. If proved correct, it may help understand the beginnings of the remarkable Avebury monument complex, and help explain why it was built where it was. The research team is currently compiling their research into a paper for academic publishing.